Caleb Strong was a Massachusetts lawyer and politician who served as the sixth and tenth Governor of Massachusetts between 1800 and 1807, and again from 1812 until 1816. He assisted in drafting the Massachusetts State Constitution in 1779 and served as a state senator and on the Massachusetts Governor's Council before being elected to the inaugural United States Senate. A leading member of the Massachusetts Federalist Party, his political success delayed the decline of the Federalists in Massachusetts. A successful Northampton lawyer prior to 1774, Strong was politically active in the rebel cause during the American Revolutionary War. He played an influential role in the development of the United States Constitution at the 1788 Philadelphia Convention, and, as a US Senator, in the passage of its 11th Amendment. 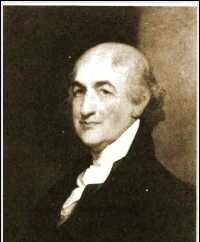 He also played a leading role in the passage of the Judiciary Act of 1789, which established the federal court system.